MIAMI (AP) — Last week, the Miami Dolphins resorted to eight-man pass protection, so desperate were they to slow an onslaught against quarterback Ryan Tannehill. And now they have to block Khalil Mack. That will be a daunting task when Miami faces the Chicago Bears on Sunday in a matchup of first-place teams headed in opposite directions. The Dolphins (3-2) are trying to patch up an injury-depleted offensive line and rebound from consecutive ugly losses. They could be without Tannehill, who is questionable because of a throwing shoulder injury that first bothered him last month. By contrast the Bears (3-1) are well-rested after a bye, riding a three-game winning streak and alone atop the NFC North for the first time since 2013. 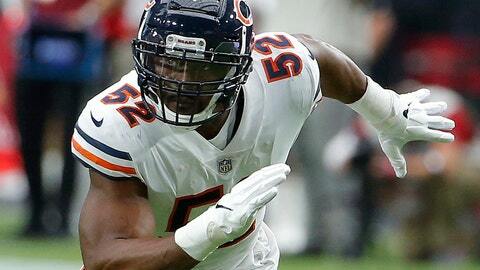 Newcomer Mack has led the Bears into first place by dominating on defense. The two-time All-Pro end has five sacks and is tied for the NFL lead with four forced fumbles. He has at least one sack and forced fumble in each game. And the Dolphins might have to confront him without left tackle Laremy Tunsil, sidelined last week by a concussion. No team this season has been able to keep Mack off the quarterback. “He’s just playing at a different level than anybody that I’ve seen,” Miami coach Adam Gase said. Now Mack faces a team staggered by season-ending injuries to two starters in the offensive line, followed by the loss of Tunsil. He was badly missed last week, when Tannehill was hit 11 times in the second half as the Dolphins blew a 17-point lead at Cincinnati. The Bengals’ pass rush was so overwhelming Miami had almost everyone on offense blocking, and even that didn’t work. Mack is well aware a harried Tannehill committed two turnovers that were returned for touchdowns. But in each of the past two games, the Dolphins’ offense has scored only one touchdown and Tannehill has thrown for less than 200 yards. If Tannehill can’t play, he would be replaced by Brock Osweiler or David Fales. The Bears’ most recent game, a 48-10 win over Tampa Bay, was their most lopsided victory in six years. A win over Miami would give Chicago its longest win streak since a six-game run in 2012. Coming off a breakout game, the challenge for Chicago quarterback Mitchell Trubisky is to show it was no fluke. Trubisky threw for six touchdowns — one shy of the NFL record held by Bears Hall of Famer Sid Luckman and seven others. It was the sort of performance the Bears envisioned when they traded up a spot to grab him with the No. 2 overall pick in the 2017 draft. Trubisky had never previously thrown for more than two touchdowns. Lost in the Dolphins’ collapse at Cincinnati was a solid performance by the defense, including young linebackers Raekwon McMillan and Jerome Baker. When Gase was the Bears’ offensive coordinator in 2015, among those who helped him prepare to become a head coach was Vic Fangio, who is still Chicago’s defensive coordinator.